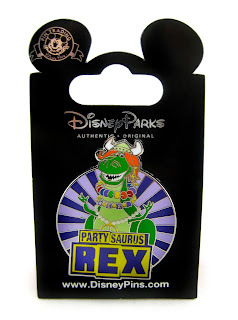 For fans of the hilarious Toy Story Toon: Partysaurus Rex, here we have this very cool Disney Parks Authentic pin based on the short! Though this pin has been out for quite some time, I just recently picked it up at the Orlando airport Walt Disney World gift shop (on our way back from our Disney Cruise vacation). Retail was about seven bucks. As I've mentioned, I'm not a huge Disney Pin collector (not that I don't love them, it's just because there are so many out there to buy), but I could not resist this one when I saw it in person! Not only do I love that toon, but it's also a rare treat to actually get a product based on any of Pixar's short films. This is one of the few official Partysaurus Rex items out there! You can still find this at the Disney Parks (Disneyland and Disney World), so keep your eyes peeled during your next visit! If you'd rather just snag it online, visit HERE or eBay HERE using this direct link to current listings.